Not only is blogging encouraged, but it is honored. There is a special set of tables in the keynote auditorium for bloggers to set up their laptops for blogging. Or in my case, I was Twittering about the keynote with my iPhone. Indeed, during yesterday’s keynote with with VMware CEO Paul Maritz, the announcer invited attendees to use Twitter to send in their questions. The person next to me was from Denmark and didn’t understand what I was doing. He had never heard of Twitter, so I sent him to Twitter.com. By the way, my real-time “Tweets” (noun form of Twitter) on this show can be found at this link. Note, they’ll appear in reverse chronological order, most recent at the top. John Troyer of VMware, blogger and podcaster extraordinaire, was doing several podcasts live from the Communities Lounge at the Solutions Exchange on the show floor. 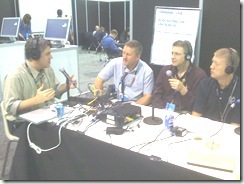 John is very involved in VMware’s blogger community and end user communities. He has lots of community management experience. Here you see John interviewing user moderators from VMware’s communities. You’ll find John at the VMTN Blog and his podcasts here. While this is a show about virtualization, there is also a virtual show going on at the same time. Eric Nielsen, VMware’s Director of Web Communities showed me around the virtual, online pavilion. You can access it directly from the VMworld.com website, or from here. It is a two dimensional virtual world that an attendee can navigate through and visit various rooms. As an attendee navigates around the Virtual Pavilion he or she can see other attendees, participate in contests and games, gain points for answering questions on multiple choice questions, etc. This virtual navigation system is a 3rd party module for Clearspace, the social networking technology that VMworld.com uses. There are even “Expert Sessions” non-synchronous “events” — talks that you need not be present to hear — where a speaker will provide audio, video, content or a whitepaper which is then attached to a forum. The expert will visit daily for the next two weeks to answer any questions. The Virtual Pavilion also features 15 “hidden rooms” where you can find special clues, quiz answers, and secret codes for a free t-shirt at the Communities Lounge. One of these hidden rooms is the Restroom, which itself has a portal to a hidden room. Eric manages VMworld.com year round. It is active not just during the semi-annual shows, but throughout the year. Various Partners have “booths” here. Can you find the “hidden room” in the Dell booth? And as I mentioned before, the VMworld.com website features attendee blogs as well, found here.